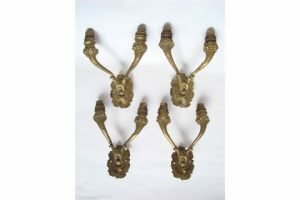 A pair of Louis XVI design twin branch ormolu wall lights, with central urn and swag. 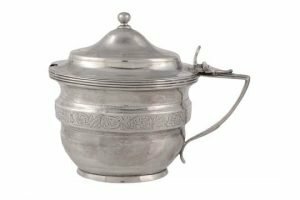 A George III silver oval baluster mustard pot by Alexander Field, London 1804, with a ball finial to the domed cover, a moulded harp handle, a rounded thumb piece, the pot with a raised foliate meander band, with a clear glass liner. 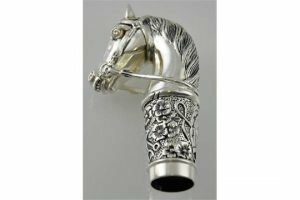 A silver plated horse shaped walking stick topper. 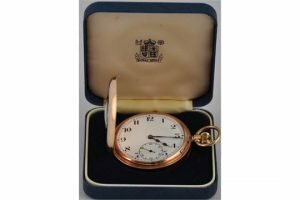 An early 20th Century 9ct gold half hunter pocket watch, the circular white Arabic dial with subsidiary seconds and black enamel outer numerals. 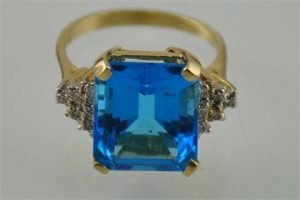 A yellow gold Art Deco style large blue topaz and diamond ring. 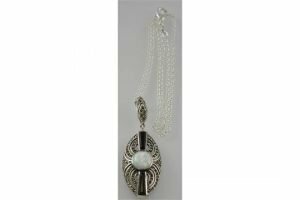 A silver marcasite and opalite Art Deco style pendant necklace. 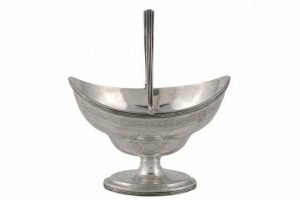 A George III silver oval ogee pedestal sugar basket, maker’s mark over-struck by that of George Burrows I, London 1798, with a reeded swing handle, a foliate band and M and B within wreathes, on a moulded oval pedestal. 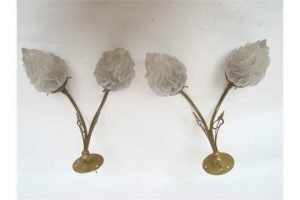 Four late 19th Century ormolu two branch wall sconces, with foliate scroll candlearms and an oval acanthus leaf back plate. 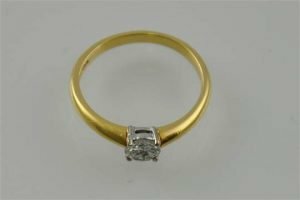 An 18 carat yellow gold solitaire diamond ring, the claw set stone 0.5 carat. 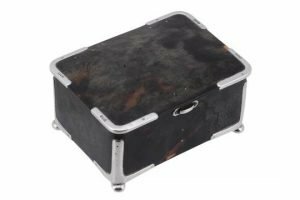 An Edwardian silver mounted tortoiseshell casket by Harry Adelstein, London 1901, stamped for Thornhill & Co., New Bond Street as retailers, with plain silver angles, hinges, catch thumb piece and bun feet. 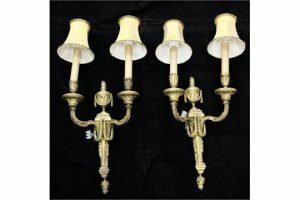 A pair of late 19th Century gilt brass art nouveau design twin branch wall lights, with frosted glass flame shades. 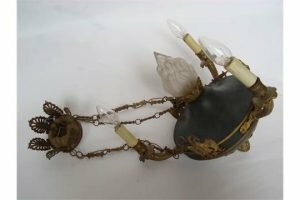 An early 20th Century French Empire style four light green tole and gilt bronze chandelier, the body issuing three foliate candlearms and with central light fitted with frosted glass flame shade, mounted with pine cone pendant finial, suspended on three chains from a palmette cast corona. 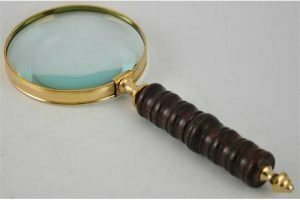 A large brass bound table magnifier with a turned wooden handle. 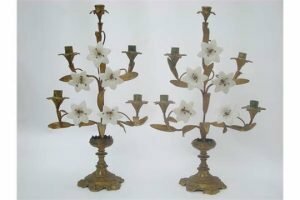 A pair of 19th Century French gilt metal lily spray five light mantel candelabra, with opaline glass flowerheads, on spreading base. 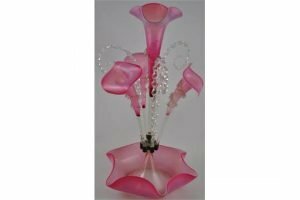 A late Victorian cranberry and opaque glass epergne, the four flutes divided by twist canes on shaped circular base. 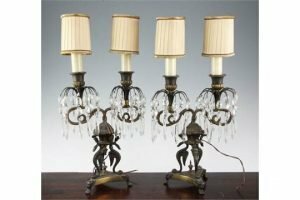 A pair of Empire style twin branch lustre drop table lights, with scrolling winged beast columns on a tripart base. 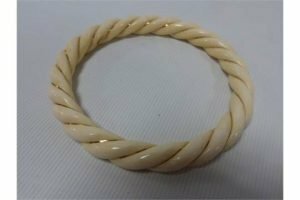 A rope twist carved Ivory bangle with 14ct gold wire decoration. 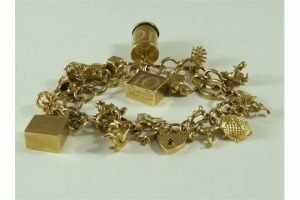 A 9 carat gold bracelet of narrow curb links, to a padlock clasp with safety chain, with charms attached, 43.7 grams. 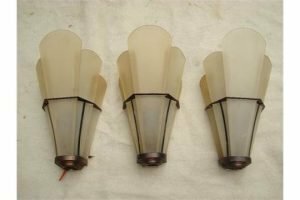 A set of three Art Deco frosted glass fan shaped wall lights, with an additional set of glass panels. 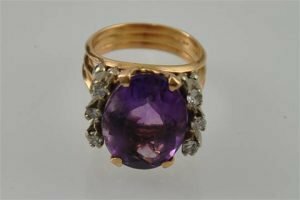 A yellow metal ring, the central amethyst of approx. 7ct surrounded by diamonds.